better known as Walter Davisson, M.D. Country Club Lima Hotel, Lima. Photo: Lola Salas, Rumbos Online. Based on this guest's comments; we have changed from the Country Club Lima Hotel to the Orient-Express Miraflores Park Hotel, changed from the Sol y Luna Lodge to the Urubamba Villas and omitted the optional excursion to the Intiñan Museum with lunch at La Choza. Late arrival in Lima. Delta used a 767 with a terrible business class section. Cramped row pitch and no leg rests on the seats were the highlights of Boeing's worst airliner design ever. Checked into Country Club Hotel. Large room, no balcony, view of an adjoining street and a casino/hotel. Excellent staff, fine room service breakfast the next morning delivered promptly and hot. 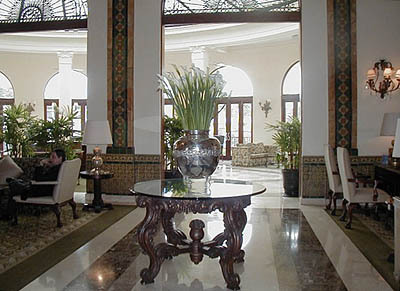 The hotel itself is a colonial gem with period style and panache. Lovely setting from the front rooms (which we did not have.) Our room (#367) itself was quite large but could have used much more furniture and wall decorations. The towels and bed linens were well used but clean and fresh. The lobby and greeting staff were superb. With a front room, this hotel would be a gem. Ophelia Larco, our guide, was a 4 star (out of 5). Photo: Mylene d'Auriol Stoessel. 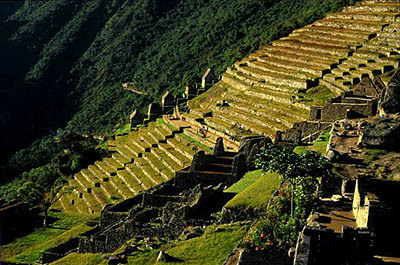 Machu Picchu Luxury Tours, Travel & Galapagos Cruises. Very early departure for the airport for connecting flight to Cuzco. Met at airport by our guide Sheyla Robles. She is definitely a 5 star experience. Young, educated, knowledgeable, and fluent in English. 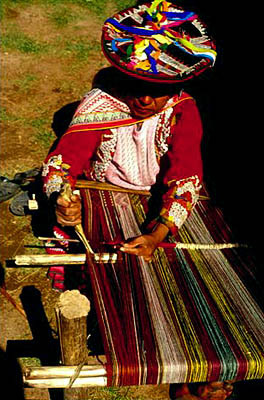 Tour Chinchero (excellent alpaca sweaters and weavings--all done with natural dyes and materials.) How the women in the co-op do this day after day is an unfathomable mystery to me. I would go stark raving bonkers and soon request a meeting with Drs. Smith and Wesson. On to Moray (stunning in its planning and execution) and the salt pans of Maras (still in use today). Excellent lunch at El Huacatay--a hidden gem. Check in at the Sol y Luna Lodge. Best described as a high-end white collar detention facility. Great design, fine execution, but a walled compound with solid gates that are closed and secured at dusk--not to open until the next sunrise (security problems in the area?). Food was good and nicely served at dinners and breakfasts. (Cuy is a lot of bones and little meat--tastes like domestic rabbit). Towels were well-used, pillows were really crappy, no room TV, and ultimately a very dull place with no night-time action. 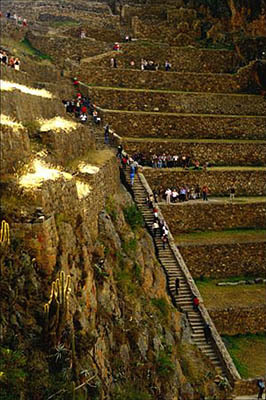 On to Pisaq and Ollantaytambo for more fantastic Inca civil engineering. Both attractions are spectacular. Lunch at Hacienda Huaroccari was a group affair with approx. 32 tourists and guides in all. Lovely setting in the hills overlooking the Urubamba valley. Good food and service. Back to Sol y Luna for another night of detention. Overnight at the Sanctuary Lodge in a mountain view room (lovely view). The hotel itself is the only one at the site and hence cannot be seriously criticized. The room was however very cramped with tired furniture and sad appointments. The towels and linens were, however, first-rate. Food (lunch buffet and dining room dinner and breakfast) was fine and well-served..
Courtyard of the Hotel Monasterio, Cuzco. 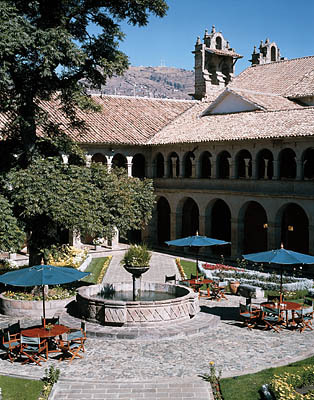 Transfer back to Cuzco and check into the Monasterio. The hotel is beautiful and exceedingly well-maintained. Staff is well-trained and unobtrusive. Room was slightly on the small side but had an expansive arcade balcony overlooking a small courtyard with a fountain--a lovely experience. Dinner there was very good and service was excellent. The Cuzco area touring was excellent. Lunch at Pacha Papa, with it's wood-fired courtyard oven, was a delicious and welcome break. Food was very fresh and very homestyle--altogether a great place constituting a lovely interlude. Back to Lima and room #367 again at the Country Club. Touring Lima central plaza and the Museo Larco. Lunch at the museum (very good, no frills, simple and very nicely done). 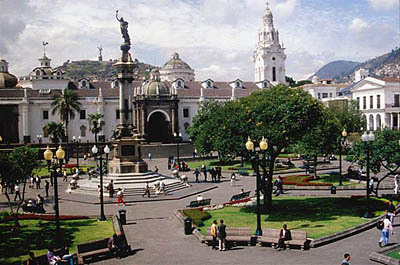 Lima, the city, is without a doubt , the armpit of the West coast. Little to recommend it to anyone except for embarkation and dispatch. Ofelia Larco again did an very good job for us. Dinner at Astrid and Gaston was very good with exceedingly large portions--perhaps this is a Peruvian tradition. Service was warm and friendly. 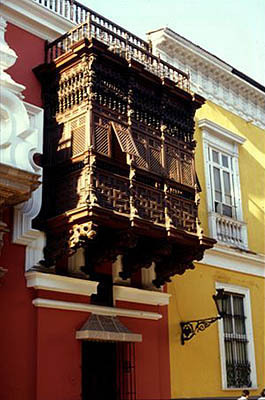 La Merced Suite, Villa Colonna, Quito, Ecuador. 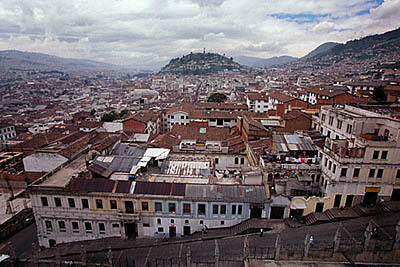 Off to Quito and check in with Rodolfo and Rigoberto at the Villa Colonna. This B&B was the hidden and unexpected gem of the journey. The boys are most welcoming and the stay felt as though we were visiting our cousins, rather than a commercial establishment. The transformation that they have done with a decaying pile of adobe bricks is astounding. We were given a street-side suite with sound-resistant shutter doors on the three French balconies. The sitting room sported a fireplace, lovely desk and two very comfortable couches. The bedroom was very nice and also well-furnished. The bathroom was comfortable and very pleasant in it's arrangement. We especially enjoyed the large walk-in shower. The entire establishment was beautifully decorated with personally-selected antiques, all in their proper positions. The breakfast was the best of the trip. The rooftop deck with its view of the city both night and day was absolutely lovely. The place was exceedingly neat and clean and very well thought out. Definitely a 5 star B&B. Dinner that evening at Blu was a tour-de-force of au courant, hip fusion cuisine in a starkly modern setting. The food was excellent and the service was exemplary--highly recommended. The tour of Quito and environs the next day was an introduction to the finest colonial town center ever experienced. Only the town square of Brussels compares and it is of a different era. Lunch at La Choza was a disappointment with very poor, delayed service. My fish was dry and overcooked, the vegetables were obviously snatched from the freezer, and overall I would not recommend it. Later we were taken to the Museo Intifan which was an Ecuadorian version of "See the Seminole wrestle with a Real Alligator" spots which dot the roadsides of my home state. I would eliminate it from the tour-not worth the time or gasoline to get there. Extremely hokey and contrived. Anyone with a background in science could see through the patter immediately. Dinner at La Belle Epoque. After seating us, the maitre'd decided to move us to a plaza-view window corner table-most thoughtful. The lovely and very chi-chi food was delicious (but Argentine beef is a tooth working experience compared to Midwestern corn-fed). The Viennese dining room decoration scheme was quite authentic but seemed non-harmonious with the very modern and sculpturally composed cuisine. Service was unobtrusive and excellent. We skipped the horse and carriage ride because of a light rain. Another stay that night at the lovely Villa Colonna with a 5 AM departure for the airport. Rodolfo arose extremely early to be sure that we had coffee before departure. Photo: Quasar Nautica. 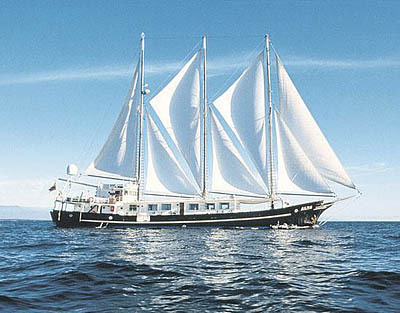 Luxury Galapagos Cruises. Arrival in The Galapagos for the cruise and a week of strenuous activity. I would be certain that all tour participants are made aware that this is not a laid-back week of gentle strolls and swims. Our guide-naturalist was descended from storm trooper blood and delighted in 5:30 AM wake-up calls so that we could be the first group on the island for his death march viewing experience. Then return to the boat for breakfast, a short break, then don wetsuits, jump into the panga for a 2 hour snorkel adventure followed by lunch, a small siesta, and then redeparture for land to trek some more. It is not a suitable experience for the non-fit. The wildlife is, of course, stunning in it's development and diversity, and the experience is not to be missed if the body is up to it. The Alta itself has a good crew; plain, plentiful and simple food decidedly on the underseasoned side, and Cabin 1 was comfortable. Do not book cabins 7 or 8 which are plagued by extreme vibration, noise and diesel fumes for your clients. Cabins 1 and 2 are the best. The boat itself is past its prime, but so are all the others we encountered during the week. Met a young Aussie who was in Ecuador for his best friend's wedding and had met the CEO of the cruise operator at the wedding. He was told that the company buys used, but serviceable, vessels and uses them until they wear out. The Alta could use new strut bearings and better exhaust muffling. The interiors are plain, robust, and serviceable. The vessel is a glorious sight with its sails deployed but unless we men on the cruise prodded the captain, they did not go up. Early return to Cuzco, met by Karla Rodriguez, and whisked us off to the Central Bank Museum. Karla is a young guide who could use some work on her English, her knowledge base, and attention to detail. I would rate her 3 stars out of 5. She will be great with more experience. This museum is a most rational and exceptional presentation of the pre-Inca cultures that later became part of the larger empire. The artifacts (including the colonial collection) were exceptional in their quality and very well displayed. Definitely worth the time. The park across the street has an extensive vendor collection and multiple artist's paintings on display for sale (at least on Saturday). As a member of the art gallery scene in Sarasota, I was amazed at the quality of some of the paintings and the prices were so inexpensive that I purchased a triptych that will make a fine addition to my contemporary dining room. Late departure for the USA on Delta. This time a Boeing 757 with a real business class with excellent row pitch and seats. Arrived in St. Louis at 9 AM, kissed the soil of the USA, and collapsed into my own bed for 6 hours. The tour overall was a great experience. I would highly recommend it (and have) to others interested in the itinerary. P.S. It would be wise for you to specify only sedans for private two-person tours like ours. The Renault van that was used throughout the Cuzco portion of the tour was uncomfortable and noisy. There is no need to use a 8-10 passenger van when only two people are being transported.